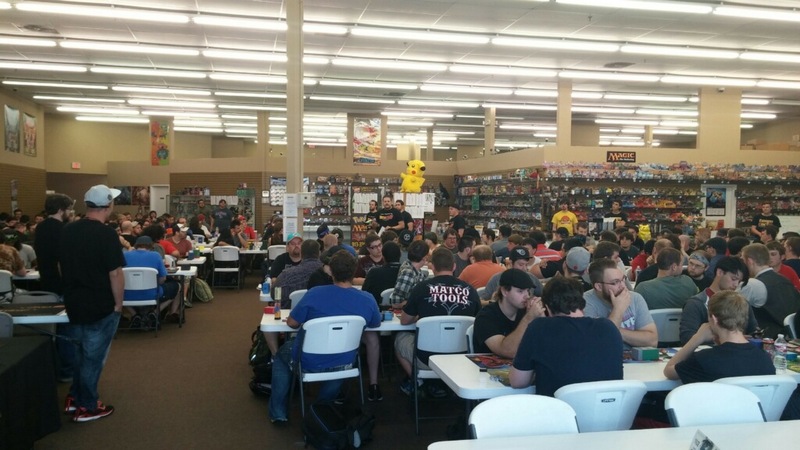 The Dragon Ball Z Regional event at Collector’s Cache in Lenexa, KS is officially underway! 192 players turned out to battle for eight rounds and take their shot at making top sixteen! With a crowd of 192 players, packs will be given out all the way down to 96th place. In addition to the promos and cash prizes, everyone in the top 16 (except 1st/2nd place) will take home at least 24 packs each. Black Mastery – Garlic Jr.
We are well on the road to qualifying two more players for the 2015 World Championships here at Collector’s Cache in Lenexa, KS! UPDATE – Top 4 … and the road to the finals! WOW! What an exciting day full of Dragon Ball Z in Kansas! Collector’s Cache has been a wonderful host to eight strong rounds of Swiss and a very competitive top cut. We have seen a dominating performance by Black Devious Mastery paired with the SDCC Krillin… but how would it fare in the top cut? Four players, Three Krillins, Two Black Devious Masteries, and a partridge and a pear tree later, we had our finals match and two new qualified players for the 2015 World Championships! In an event that included players from 21 different states (including Alaska) and 192 total players, your winner of the 2015 Kansas City Regional is…. Troy Nelson with his Black Devious Mastery Krillin build in three games! Thanks to Next Level Z and Collector’s Cache for a great event and a great twitch TV stream today. Who will be the next to qualify for the World Championships? Check back in two weeks when we travel to Kentucky for the next Regional on the circuit. Seeing all this makes me want to stop running my black krillin. If anyone is there tell them that they need to fix all the spelling errors on cards especially character names like tIenshenhan jEIce ChaoTzu leaving out letters like a champ panini. All character names are subject to approval and correction by Funimation and Toei. You’re welcome to comment to them about how you think names should be spelled!